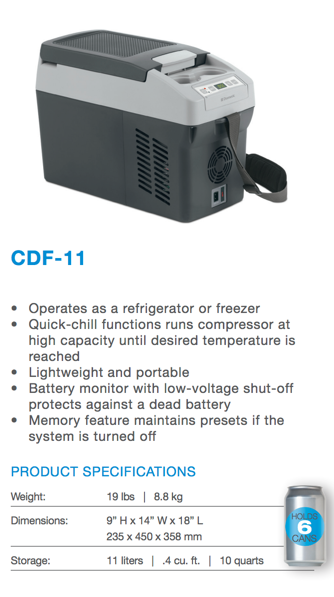 Click the button below to add the Dometic CDF-11 Portable Refrigerator Freezer to your wish list. The Dometic CoolFreeze CDF-11, which is suitable for deep freezing, represents a new era in the world of compressor coolers. And that in a size which previously seemed impossible. Compact and therefore an optimum fit – in corners, cabinets and in vehicles – strapped in on the passenger or rear seat. 11 liter volume, refrigeration and deep-freezing down to –18°C, regardless of high ambient temperatures. Only 19 pounds in weight, and the shoulder strap makes it comfortable to carry. DC connection cable. Great price and stellar customer service. Very pleased with our purchase. So far, so good. The customer service was very responsive and helpful selecting the right electric cooler for our family's needs.